For my family and friends reading this: I'm writing this post more as a guide to other visitors to Santiago who are interested in cycling here, and less as a diary of what Caroline and I have been up to. Santiago is sort of in the "uncanny valley" of being a good biking city. If you haven't heard of the uncanny valley, it's the idea that when a robot or animation is really close to the real thing, it actually starts to look creepy and worse than something that is far from the real thing. 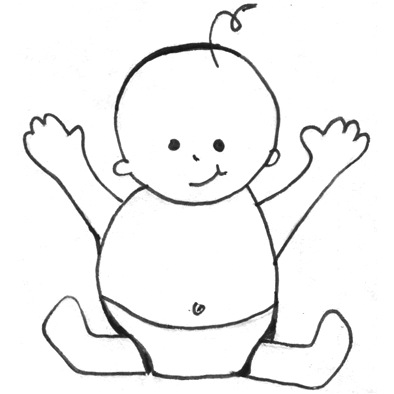 For example the sketch of the baby on the left looks way less like a real baby, and it's kind of cute. 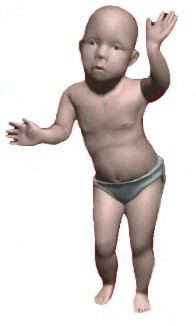 The dancing baby on the right is much closer to looking like a real baby, but sort of creeps me out. When it comes to biking in Santiago, it's kind of the same way. The city actually has a ton of dedicated bike paths. Awesome! It's a flat city with few hills. Fantastic! The streets are wide and straight, and drivers follow traffic rules. Hooray! It all sounds really good, but it just doesn't quite add up to a great biking experience, and because it's sooooo close, it almost ends up being more frustrating. Hence the uncanny valley of biking cities. But there are plenty of good things about biking in Santiago. If you want to bike in Santiago, and you are coming from a decent biking city in the US, here's what you should expect. Who are the bikers here? There are a decent number of bikers here, enough that you can occasionally find yourself waiting at a stoplight with a short line of other bikers. The bikers tend to fall into two different categories, and you can easily tell them apart by the type of bike. About 75% are casual riders using a bike for transportation, and they are usually on cheap-o mountain bikes or cruisers with baskets. The last 25% are fairly serious cyclists out for exercise, either on fancy road bikes or high-end mountain bikes. Bike shops - you can find a lot of bike shops in the San Diego bike district (map). Depending on your knowledge of bikes and your knowledge of spanish, you might come out with a great bike for a great price, or you might find that every day brings a new surprise and a new problem with the bike. Bike shops are probably your best bet if you want something really high end. Department stores - if you just want a cheap bike for a travel abroad stay, I think this might be your best bet. Make your way to a Jumbo (the equivalent of Target here), and you can find new mountain bikes for around $100-120 US. Obviously they won't be amazing bikes, but it's a good price for a brand new bike. Another important thing to note: high prices on the second-hand market also helps you when you are selling your bike at the end of your stay. In the US, if you buy a new bike, you probably would expect to sell it second-hand at around 50% of the original cost, but here you can get 75% or more. You have three choices here: bike on the sidewalk, bike in the street, or find dedicated bike paths (here's a map with bike paths). The bike paths sound like the best way to go, but many of them are sand or dirt paths, rather than asphalt. Even the asphalt ones can be kind of tricky. They often run alongside a sidewalk, but if there is a tree in the way it's the bike path that curves around, so you do a lot of swerving back and forth. If your route does use a good bike path, that's probably your best bet. Biking on the sidewalk seems to be pretty accepted here, but comes with caveats. For some reason, Chileans never seem to get out of the way of each other, even if you ask and say "permiso." If you are walking, this isn't a huge deal because you can just step to the side. But when you are on a bike it get's pretty annoying (I'm sure it's annoying for the pedestrians too). The other problem with sidewalks is that in many areas, you won't find ramps at the intersections, so you have to stop and lift your bike down and up over and over. Biking in the street is my personal choice in Boston, but it's pretty tough here. I have not seen a single street with a striped bike lane. Many busy streets do not even have a shoulder or a parking lane, so you are riding right in the far-right lane. To make matters worse, that's the same lane that city buses use, and getting passed by a bus is not fun. There just aren't enough cyclists out there on the street to feel like you have a critical mass, so cars aren't really looking out for you. Definitely wear a helmet if you are biking in the street. You might not notice it just walking around, but the entire city of Santiago is on a slight grade, going downhill from east to west, coming down from the mountains. It's so slight that it doesn't affect you much on foot, but on bike you'll definitely notice it. Trips west are waaaaay easier and faster than trips east. All the usual guidelines about locking up your bike apply here as well - use a U-lock, don't leave it out overnight, etc. Similarly, it's a good idea to wear a helmet and when biking at night, get some lights. We have heard there is something like Critical Mass here, with thousands of riders taking to the streets for a couple hours to ride together in a big group. It happens about once a month, and Caroline might actually go tonight to check it out (I can't go because of tutoring). If she does go, we will be sure to post pictures and a report. Santiago does seem like it's on its way to being a great biking city. It's clear they are trying hard to create good infrastructure for cycling, but right now the paths are too disconnected and in some cases too rough to add up to a good experience overall. There does seem to be a growing bike culture, but it's far from normal to be riding in the street, which means that cars aren't very aware of cyclists. From everything I've read, getting more cyclists out on the street is the number one way to make a city safer for cyclists, so Santiago - I'm cheering for you! How does this all compare with your city in the US? Or if there are any other Santiago folks reading this, any additional tips or advice you'd offer to new cyclists here?